Whew!!! What a lot of people at the OOAK today! Granted, my friend and I usually go the second week it’s open, when the hubbub has died down some, and so there aren’t lines literally out the door, snaking down the length of the football field-sized hall, and around the corner to the very end of the building, but whatchagonnado? We decided to get there right on time, and so we were committed to our course of action. Happily, once the clock hit 10AM, the lines moved pretty quickly into the building, and off we went! It was nice to have a bit of money to spend this year at the show, as opposed to other lean years when scraping together enough to buy the tickets to get on was an effort. I wanted to make sure to spend it at the booths, too, as these artists and artisans work really hard at their craft and deserve support. I only bought four things today, as I didn’t have much money, but I’m pretty darn pleased with my choices regardless. 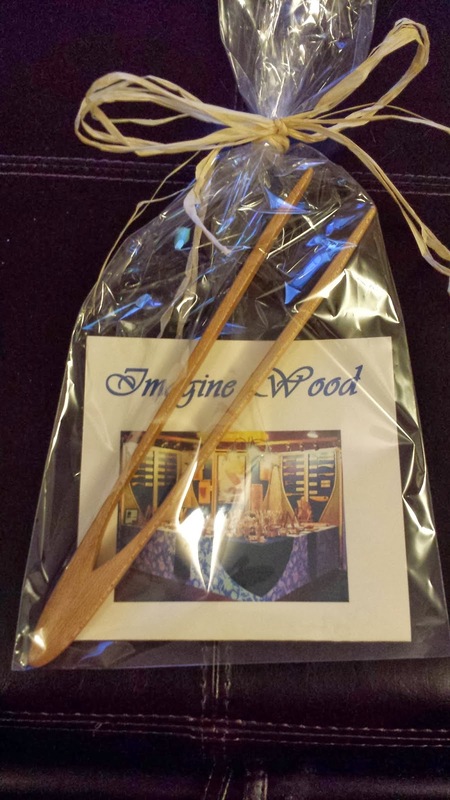 I bought a rock maple set of toaster tongs from the booth Imagine Wood for our toaster oven. The Hubster likes his toast and doesn’t like to burn his fings…what can I say? We used to have a great bamboo set from The Pampered Chef that was over a decade old, but then *someone* (cough cough Erinyth) stuck our venerable tongs on the handle of the toaster oven a few months ago, which promptly cracked the poor tongs in two the next time the toaster was opened. Hot glue and swearing just wasn’t keeping them together anymore, so it was time to retire them for a new, stronger set! 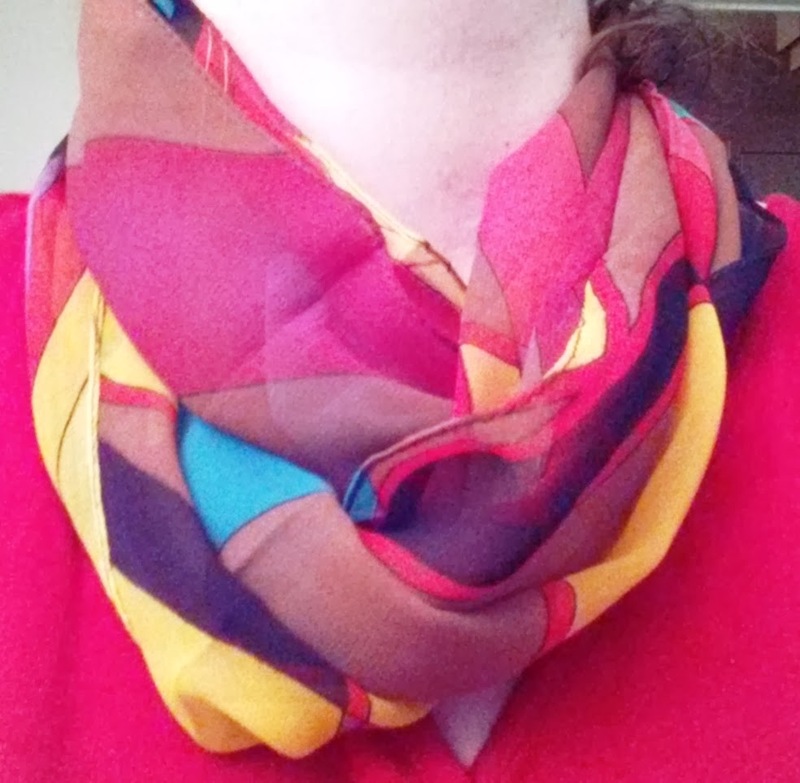 The second purchase was my beautiful recycled silk scarf from a new artisan booth called Sinate Creations. I *knew* as soon as I saw it that it had to be mine…this scarf is so light and soft on my skin, and it’s in my favourite colours (known as “everycolour”!). I kind of imagine it’s what a 1970’s LSD flashback might look like. My third purchase will remain a secret for the time being, as it’s a gift for my newest baby nephew, and I know his mummy sometimes reads this blog (Hi sis! Captain Shriekypants will have a coolio Christmas gift from Aunty Loonybin and Uncle Grumpasaur this year! ), but my fourth and final purchase, if you know me at all, just *had* to be a food item! I know, “colour me shocked”. There are several food vendors at the OOAK I tend to go back to every year; I’m a big fan of the various sauces and marinades, Christmas puddings with the best warm vanilla hard sauce I’ve ever had, crazy hummus from the Greek place, and a whole host of chocolate places (mmm, Tickleberries!). But, if I only have enough money for one food item, the one I invariably will purchase something from is The Milsean Shoppe. They make simply the best chocolate covered toffee ever ever EVER! Their Demerara Butter Crunch bar will have you weep with joy. There are five different butter crunch bar flavours available: Original, White Chocolate/Almond, Dark Chocolate/Almond, Milk Chocolate/Hazelnut, and Maple Syrup/White Chocolate/Hazelnut. They have a bunch of other items too, but those bars are the ones that melt my heart (and increase my sugar consumption by a factor of a lot). There are few candy bars for which I will happily pay a premium price; this is one of them. I still have two bars left….no, must resist urge to nom….save…for…later…..nomnomnom…. Previous Post Collection: Black Friday! Next Post It’s the Most Wonderful Time of the Year! A month of Christmas baking posts!